Are you going to appear in an interview for the job of CCNA expert? Are you looking for latest CCNA interview questions? If yes, you’re in the right place! Cisco Certified Network Associate is the certificate from Cisco and it is an associate level certification that will be very useful while you are looking to find job opportunities in the IT sector as a networking professional. As a certified networking expert, you may find the opportunities for the vacancies of network support engineer, technical support engineer, network and system administrator, desktop support engineer, system engineer, hardware and networking engineer etc. Answer: Routing is the process to find the right path to transfer the data from source to the destination. The devices named routers are used for routing process and these devices are network layered to complete the process. 2. What is the network address? Answer: The network addresses are used in packets. Each of the network address will have the network path to identify the particular data link. It will also have a node and host path to identify the specific device. 3. Tell about the types of IP addresses used at the present time. Answer: Two types of IP address is used including IPv4 and IPv6. IPv4 is 32-bit address and IPv6 is 128-bit address. 4. What is the purpose of data link layer? Answer: The data link layer is used to check the messages that are needed to be sent to the right device. Framing is another function of the data link layer. 5. What is a Node? Answer: It is the connection point on the networks that are used for data transmission. It may be a computer, printer or any other device that can send and receive the data over any network. 6. What will be the function of the application layer in the networking? Answer: The application layer is used to support the communication components of application and it will provide the network services to the application process that will span beyond the specifications of the OSI reference model. Answer: It is one of the best CCNA interview questions that you shouldn’t miss during the interview preparation. 100BASE-FX is a version of faster Ethernet over the optical fiber. 8. State the advantages of using switches. Answer: When the switch will receive a signal, it will create a frame out of bits received from that signal. In this process, it will access and read the destination address and after that, it will forward the frame to the right port. It is considered as the perfect way for data transmission instead of the distribution of the data on all the ports. 9. What do you mean by a window in terms of networking? Answer: In networking, a window is used for the number of segments that will be sent from the source to destination before sending back an acknowledgment. 10. Is a bridge used to divide the network into the smaller sections? Answer: No, a bridge actually works to take the large network and filter it. It will not change the size of the network. Have any query regarding CCNA certification? Just write in the Whizlabs Forum and start a discussion with the certified experts. 11. Which LAN switching method is used in Cisco catalyst 5000? Answer: In Cisco catalyst 5000, store and forward switching method is used. It stores the entire frame to buffers and performs CRC check before deciding on the forwarding or not of the data frame. Answer: BootP is a protocol that is used for the booting of diskless workstations connected to the network. It is also known as a boot program. It is also used by diskless workstations to determine its own IP address as well as IP address of server system. 13. What will be the advantages of LAN switching? 14. Can you explain the terms multicast, unicast, and broadcast? Unicast: It is used to specify one to one communication. Multicast: It is used to specify one to group/many communication. Broadcast: It is used to specify one to all communication. 15. Can you differentiate static IP address and dynamic IP address? Answer: A static IP address is reserved and it will not change over time. On the other hand, a dynamic IP address will be changed every time when you will connect to the internet. A static IP address is provided manually while the dynamic IP address will be provided by the DHCP server. Answer: When you are looking for some of the important CCNA routing and switching interview questions and answers, you must know about the term VLAN. VLAN stands for Virtual Local Area Network, it abstracts the idea of LAN by providing data link connectivity for a subnet. 17. What is the difference between transmission and communication? Answer: Transmission is the process to send data from source to destination and communication is the process to send and receive data by using the externally connected data cable. 18. Which one is the second layer of the OSI layer model? Answer: In some of the important CCNA interview questions and answers 2018, you should know about the different layers of the OSI model. The second layer of the OSI model is the data link layer. 19. What can be the possible ways for data transmission in CCNA? 20. Can you tell about the difference between IGRP and RIP? Answer: RIP will depend on the number of hops for determination of the best route to the network. In IGRP, several factors are considered to decide the best route to the network. In all these factors, there will be reliability, bandwidth, hops count, and MTU. 21. What do you mean by PoE? Answer: If you want to search for the most important scenario based interview questions CCNA, you should know about this term. PoE stands for Power over Ethernet. it will be used to pass the electric signal with the data at a time. Answer: MAC address is used for Media Access Control address. This address of the device is used as identification of media access control layer in the architecture of the network. It is usually stored in ROM and it is unique for every device. 23. Can you differentiate the terms ARP and RARP? Answer: ARP is used for Address Resolution Protocol that is used for the mapping of IP address to the physical machine address. RARP means Reverse Address Resolution Protocol that is used for the mapping of MAC address to the IP address. It is also one of the important CCNA interview questions that you may need to face during the interview. 24. What are the different kinds of passwords that are used to secure the Cisco router? 25. Tell about the main functions of routers. Quality of Service: QoS will be the ability of the network to provide special and battery service to the applications or set of users. 26. Which are the two types of available cables? 27. What are the functions of CDP? Answer: CDP is used for Cisco Discovery protocol that is a layer 2 protocols and works on the basis of MAC address. It is also used to find the adjacent Cisco devices. It can be used to find out port numbers, iOS details, IP addresses, switch models, router models, interface details and device ID. 28. Can you differentiate half duplex and full duplex? Answer: In half-duplex, the communication will occur only in one direction while the communication will occur in both the directions in full duplex. It is one of the important CCNA interview questions that you should know during the preparation for the interview. 29. What do you mean by latency? Answer: Latency is considered the amount of time delay. It can be measured as the time difference between the time when the network will receive data and when it will be sent by another network. Answer: MTU is used for maximum transmission unit. This term is used for the maximum packet size that will be sent on the data line without the requirement of fragmentation. It may be one of the important CCNA routing and switching interview questions and answers that you should know. To start your career as a professional CCNA expert in the IT sector, you will definitely get help with these top CCNA interview questions and answers 2018. It covers most of the important topics that you may need to ace the interview process. For every fresher as well as experienced CCNA expert, it is very important to prepare with the best CCNA interview questions while going for an interview. This list of best CCNA interview questions will not only help you to increase the job opportunity in the IT sector but also to make a good impression in the interview. No doubt, certification has its own importance in one’s career. 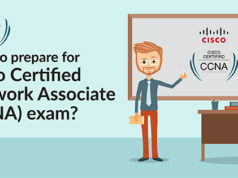 With the aim of helping you in your career, Whizlabs offers CCNA Practice Tests so you could prepare well and pass the certification exam in the first go. So, get certified in CCNA and ace the interview with these top CCNA interview questions to have a bright networking career. Wish you luck for your CCNA interview!